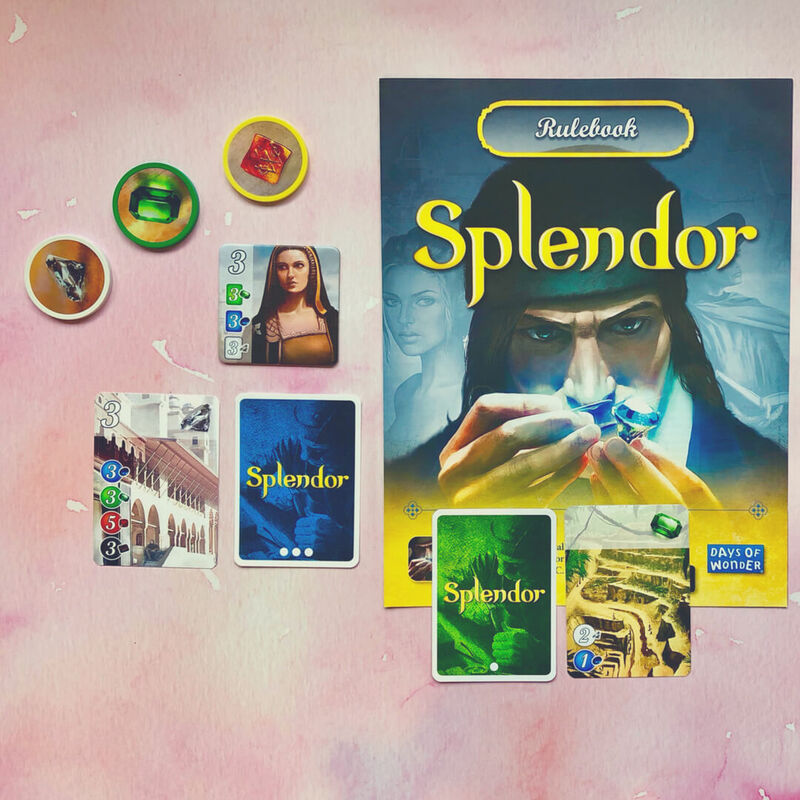 As part of the Blogger Board Game club I was sent another board game this month, this time it's Splendor - a game I had never heard of until now. The box makes it look mystic and I was intrigued to find out how to play and how much fun it would be, as were the boys. Amidst the European Renaissance, there are more ways of becoming rich than ever before! Global trade routes are now a reality and nobles, once content with large castles and fur robes, now seek dark sapphires and glittering diamonds. 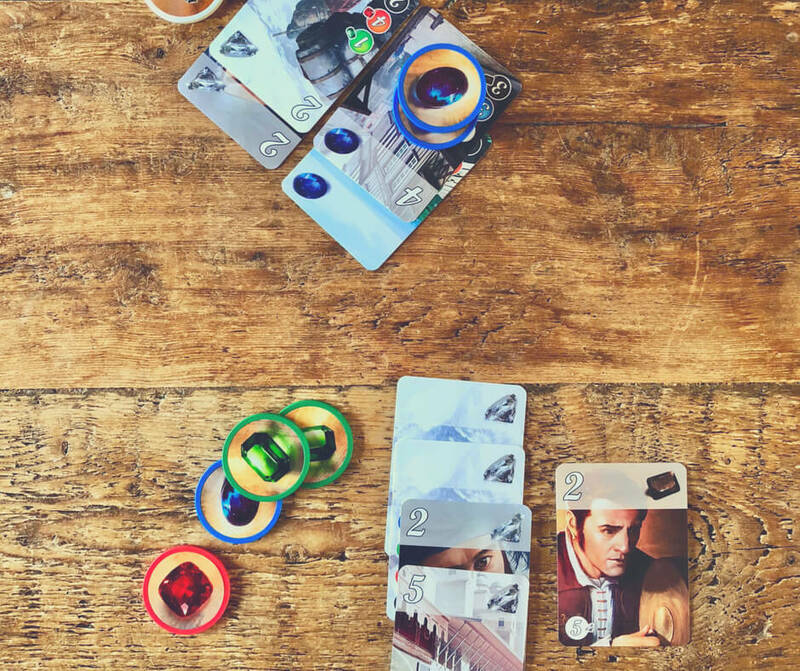 Experience the riches of this ear in Splendor, a fast, elegant, and intuitive game of simple actions and difficult decisions! As a wealthy Renaissance merchant, acquire mines and transportation, hire artisans and woo the noble patrons. Begin by collecting precious stones to trade for development cards. Use the cards to accumulate more gem stones and create the most fantastic jewellery, appeal to the nobles and gain the prestige you need to win! If I'm honest I don't think that describes the game very well - in simple terms it is a token and card game. You collect tokens to buy cards, the cards give bonuses and help you buy more cards with points on them. Once you've collected enough points you win the game. Setting up the game was fairly easy, it was just a case of reading the instructions/rules and laying out the cards and tokens as specified. But that really was the easy part. Like most games we play, we read the rules then try to play - all the while checking on any rules we're unsure of. Unfortunately with Splendor we had to have the rules on hand and referred to them quite a bit in the beginning of the game. The rules could be clearer, I had to keep checking the rules of the development cards and tokens. Reach 15 prestige points and win! Once we'd played for a while I started to understand a little better and think we got into it. As I said, it's basically a collecting tokens to buy cards game. While playing the boys kind of understood but there seemed to be a lot of confusion around the collecting and spending of their tokens. As it was our first time playing I'm going to give it the benefit of doubt and we'll be trying it again. I think in our second play through we'll probably understand better and be able to get on with it without too much trouble. 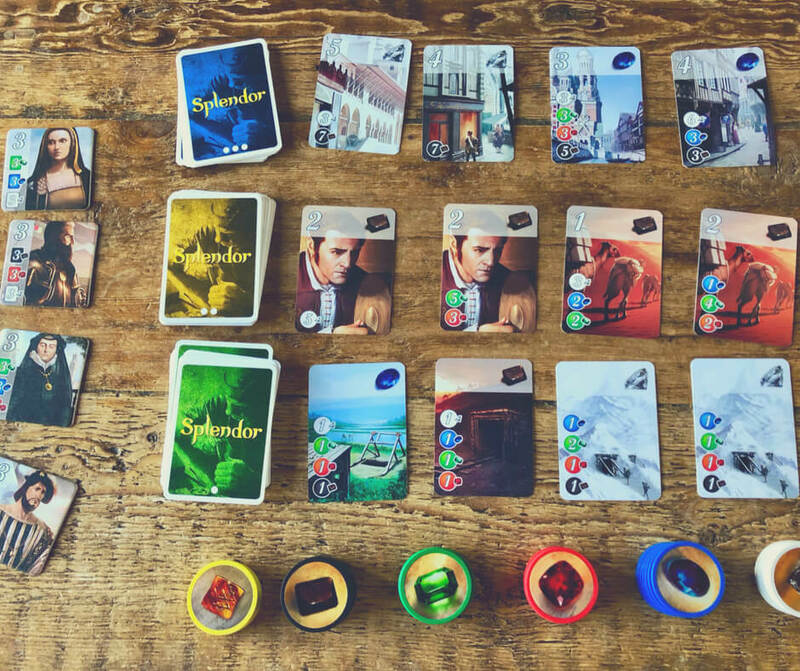 Once I understood (kind of) the rules Splendor reminded me slightly of Catan, in that you collect resources (gems/tokens) to buy development cards. Of course in Catan you build roads and settlements but there's nothing like that in Splendor. There's no board, just cards and tokens. The more development cards you buy the more bonuses you get and that helps you buy more cards. The cards sometimes have points on them too - the idea is that you buy enough to win the game. ... bonuses allow players to purchase development cards for a lesser cost. 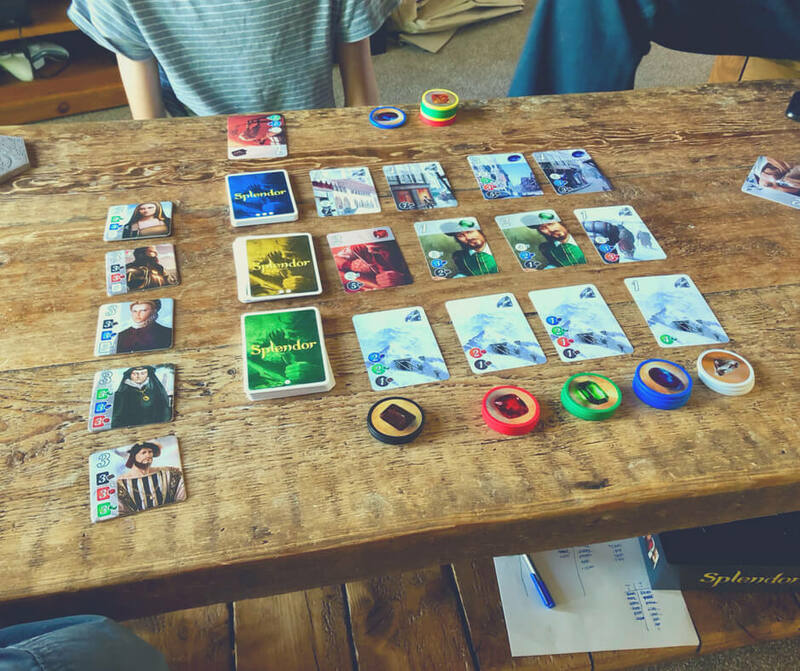 I'm not sure Splendor will make it into our favourites list, but we are going to give it another go. It's one we're still a little unsure of. 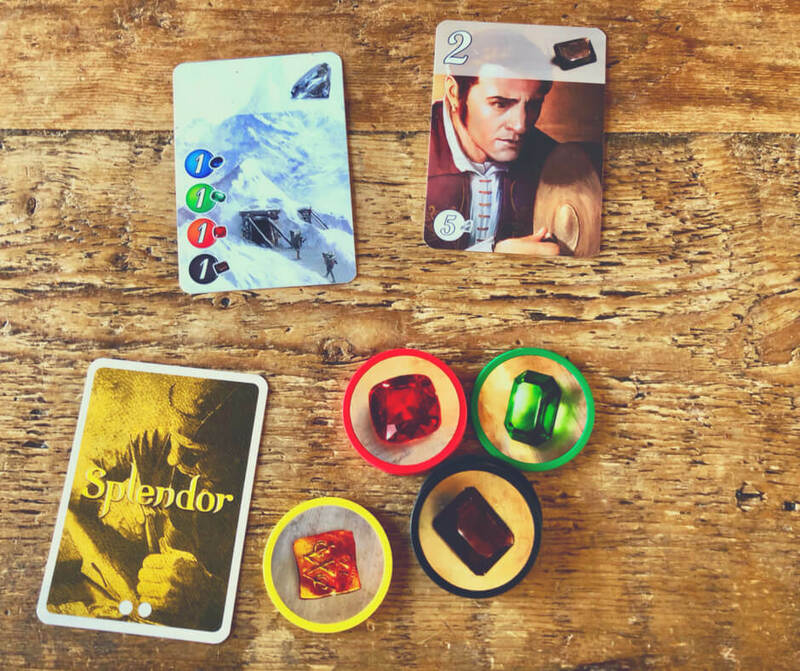 Have you ever played Splendor?